A vengeful group of villagers must figure out who among them is a werewolf (before itâ€™s too late...) Are You A Werewolf? is a deception party game for 7-15 players. Players are assigned roles secretly. Most players are Villagers, two or three will be Werewolves. This is a very unusual game. 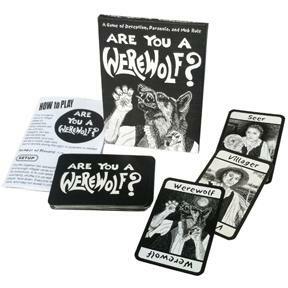 Each player is randomly assigned a secret identity, and then the group sits around and talks to each other trying to figure out which players are the werewolves. The villagers are trying to figure out who's a werewolf; the werewolves are pretending to be villagers, and trying to throw suspicion on real villagers. A moderator helps to keep the action going. are you in the mood for a great group game??? well here it is. one of the great cheap bagged games on the market. 2 players play as werewolves and their job is to eat all the villagers. The villagers need to find and kill them before they get eaten. use the help of the seer. paranoia begins to set in and before you know it, if you arent careful the villagers may begin to hang their own. awesome game for big groups! Greatest Party Game of All Time! The informed few (the werewolves) against the uninformed mob (the villagers). In this game (usually best with at least 8) there are two werewolves who know who each other are against the villagers (everyone else who do not know anything about anyone else). The werewolves get to kill one villager every night, each day the villagers have to vote on who they think is a werewolf and lynch that person. The only thing the villagers have going for them is there Seer who gets to find out if someone is a werewolf or a villager each night. Unfortunatley the Seer cannot reveal who he is to early because the werewolves will kill him the night they find out who he is. Great Great Fun!